The whole family will love these pot pies. 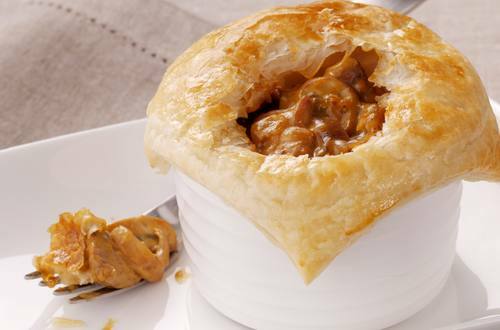 With tender beef and a crusty pastry top, this is a minimum fuss, maximum flavour recipe. 1 Heat oil in a large pan and brown beef, onions and mushroom. 2 Combine Recipe Base and water. Add to beef mixture and stir until boiling. Cover and simmer gently for 1 hour or until beef is tender, stirring occasionally. Preheat oven to 200°C. 3 Divide meat filling between 4 x 250mL ovenproof dishes. Cut pastry into quarters and cover top of pie dishes. Make small slit on surface of pastry to vent and brush pastry with milk.